Definition: The constant rate of force expelled by a compression spring per inch or millimeter of travel once a load or force is applied to push and compress the compression spring. Compression spring rate is the spring specification which will help you determine if you will be able to meet your compression spring’s working loads at the time of being installed in your application. Since this is a constant force, the amounts of load and travel increase in a consistent manner. 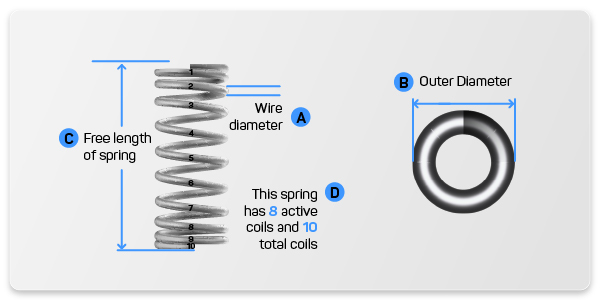 It is calculated based on your spring’s physical dimensions such as wire diameter, active coils, or outer diameter. Other compression spring dimensions like inner diameter, mean diameter, or index can be calculated using the previously mentioned dimensions. To calculate the amount of spring rate you will need on order to meet your working loads, simply divide the load you will be applying on your spring by the distance you expect your spring to travel or compress under that load. The equivalent to that formula will be your compression spring rate as shown below. Follow these examples to see how the formula works. You have a heavy duty spring that has a free length of 1” and it is supposed to travel or compress 0.2” under a load of 5 pounds. To know your compression spring rate divide the load of 5 pounds by the distance traveled of 0.2”. The result shall be 25 pounds of force per inch of travel. You have a compression spring with a free length of 5” and it is supposed to travel or compress 2” under a load of 20 pounds. 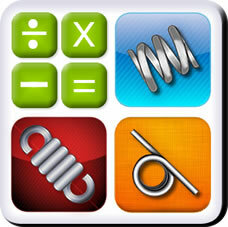 To calculate the compression spring rate of this spring, divide the load of 20 pounds by the distance traveled of 2”. The compression spring rate calculated will be of 10 pounds of force per inch.